To maintain the quality of our services as one of the top dental clinics in Dubai, we listen to what our patients have to say. Here are a few video testimonials and Facebook reviews about our services. We love getting dental clinic reviews as they inspire us to do our best work everyday. See patients’ feedback for NOA Dental Clinic here. Second time I visit this clinic and surely won't be going anywhere else in Dubai! Dr. Zul is amazing! Very warm, friendly and professional.. He even has a TV screen and plays Mr. Bean on it! Couldn't be better! And they even got discount for Emirates staff! I highly recommend it to everyone! Thank you to all the lovely staff and especially the amazing Dr. Zul at NOA dental clinic. Like most people I have a fear of the dentist but that changed when I met Dr. Zul. His friendly and warm personality has made going to the dentist a stress free experience. was visiting Dubai, over from Chicago, when the pain struck! It was a 9/ 10 pain, and I needed to see a dentist immediately. Not even being able to view my laptop screen to find a dentist, I called my wife back in Chicago (at 2am her time) to find me a good dentist, who wasn't going to take advantage of my emergency price-wise. She spoke to half a dozen and selected Dr. Zul. I trusted her judgement, since she’s a health economist and knows I like dealing with medical professionals with a good bedside manner; who are few & far between in Dubai (I previously lived in Dubai for 20+ years on & off). Dr. Zul gave my wife a price range for the extraction and warned him ahead of time what pain I was in, and he kindly offered to fit me in within an hour’s notice. I turned up to their clinic and from the moment I walked in, Lovely on reception and the NOA team made me feel comfortable. Dr. Zul was excellent right from the get-go, and trivialised my emergency to help manage my pain and concern, making me feel at ease and comfortable right away. The tooth was extracted no more than 10 minutes later. They charged somewhere in the middle of what they quoted my wife over the phone, and even gave me a free follow-up appointment the day before I flew back to Chicago, to confirm I was in good shape to fly and the wound was healing properly. I’ll be going back to have a general check-up next time I’m in Dubai and would happily recommend these folks to anyone who likes a good bedside manner and confidence that they’re in safe hands. The reason why I needed a tooth extraction in the first place was because my root canal procedure was messed up by Dr. Nicolas and ASP, who charged double what NOA were charging and had almost ZERO bedside manner or competence in my opinion. Dr. Zul offered to complete the Root Canal rather than extracting, but at that point I was dead set on having the tooth removed. So stay away from those folks…. Couldn’t recommend the folks at NOA any more highly, and I never write reviews….. I highly recommend Noa Dental clinic. The staff are nice and friendly and the place is so clean. Thank you NOA dental clinic and especially Dr. Zul for such a special treatment that I get at my each visit. There are very few doctors/dentist who can do their job in such a marvelous way as Dr.Zul .Dr Zul is not only high-professional dentist but warm and kindness man who cares about his patient and treat them in special way. I would never though that visiting a dentist can be so pleasant and stress- free . I would like to highly recommend NOA dental clinic and especially Dr.Zul . Also special thanks to dear receptionist and all staff . Wishing you all the best . having experienced dental treatments several times in difference countries, and having visited some of the most popular dental clinics in Dubai before starting my treatment, this so by far the best clinic , Dr. Zul reminds of the real meaning of being a doctor - Very passionate , honest , and so skillful , i could feel his expertise and experience in every small detail during the procedure , even the most complicated one went so smooth , no pain , no discomfort , and the result is perfect !!! a great clinic , the personnel are very friendly and helpful ! 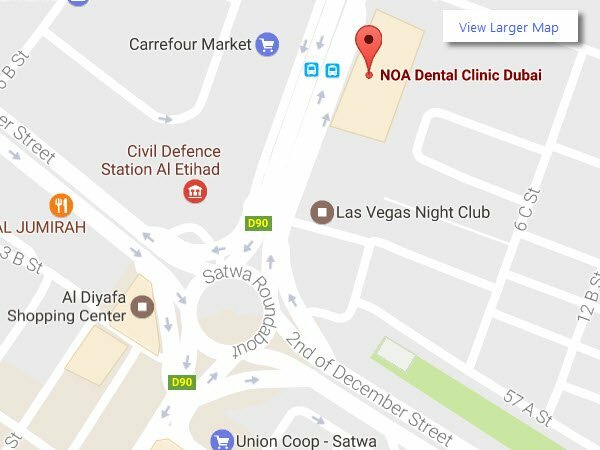 After very disappointing and rather scary and over prized experience different dentists in Dubai, I found NOA dental clinic. Felt taken care of nicely, painlessly, wasn't pushed to do things for extra charges, and most importantly the naturally caring human character of Dr. Zulu made my visit the best dental experiences ever. All I can say without any fear most of us might have, this would be the Doctor I would like my children to have too. Dr Zul, my trusted dentist over the last several years in Dubai - the absolute care and professional service you provide as a dentist gives me the confidence to enthusiastically refer all my Dubai friends to you, knowing that they will be in safe hands. Your staff are also an asset to the clinic as I always find them to be well spoken, friendly and accomodating. Very professional, welcoming and friendly clinic. I am very impressed, totally recommend it!! Had such a wonderful experience at NOA Dental clinic. The staff were super nice and professional, The doctor made me feel comfortable and explained everything in detail to me. So happy I found this place and recommend it to anyone. I visited Noa dental clinic through a recommendation of my colleague, since then I haven't been anywhere else. Dr Zul my dentist treated me for a root canal, crown, bridge and many more treatments. He is the best in the business, very professional, friendly and always explain clearly what needs to be doing. I trust him 100%. The clinic is clean and good value for money. Got Cleaning and a Root Canal Done with Dr Zul. My teeth now shines bright like a diamond. Amazing work and very friendly staff working at the front desk. I recommend NOA to everyone. I used to have a great fear going to dentist, but since I start going to NOA dental clinic everything has changed. Dr. Anupama Jaswal she is exceptional. Excellent service I love how the way she take care of the patient. One of the best dentist I know and she doing a great job. All the staff are pleasant and helpful. I would highly recommend it to everybody. This is truly 5 star service. Thank you so much Dr. Anupama and Ms. Dhel Dela Cruz. They are really great and so nice. They will make you feel very comfortable with them. I highly recommend this clinic, the prices are reasonable. All the staff are good, also from the moment you step on them, the reception will surely give their attention to you. 1. They were the only people to respond and help me in an emergency on Friday afternoon. 2. Their price is very reasonable. 3. Staff is very friendly and helpful. IS A STAR...... SHE IS VERY GENTLE AND GAVE A STRONG FOLLOW UP AFTER THE 1ST EMERGENCY PROCEDURE, RESPONDED TO MY CALLS IN ODD HOURS (whenever I felt pain), EXPLAINED THE WHOLE SITUATION AND DID THE ROOT CANAL PROCEDURES WITHOUT PAIN. Doctor Zul is the best ever Dentist , because he recommend for the best for my tooth is lumeener cement, now is look great, thanks Doctor Zul keep up the good work and more power..
Small world - Dr Zulu was my dentist 30 years ago back in London and here we both are in Dubai. Anyone looking for UK best practice dentist services in the UAE need look no further than NOA. Dr Zul is a dentist who is from another elk. NO PAIN is his moto and patient comfort is his prime focus. Amazing clinic and Dr Zul is the nicest and kindest man. I took my mum to see him and he put her at ease straight away! I will be back myself very soon. Thank you for a great experience and fitting us in so quickly. An amazing and friemdly team from the Dr's to the reception staff, highly recommended! If you are looking for the best Dental Clinic, you don't need to have a second thought . NOA Dental Clinic is the Best! Dr. Tania, thank you!! This is the BEST DENTAL Clinic that I've been to so far in Dubai! I visited the clinic today. Dr. Tania Mumtaz, unlike other dentist who treated me, explained everything to me comprehensively. She answered my questions even before I ask them. She was warm and reassuring on every step of the dental procedure I did. I was very satisfied with the result!!! She was supportive and most important of all, I did not feel that the clinic was juicing me of my money to get procedures I don't really need. My time, money and smile well spent! Thank you so much! Dr Zul and assistant Jerry was amazing! This is one of my best dental experience. Highly recommended ! I can honestly say this is the best dental clinic I have ever been to. How many people can say they actually enjoy going to their dentist? Probably not that many! I cannot express enough how satisfied I am with the services at NOA. DR Zul is incredible, so efficient, super friendly and really makes your visit thoroughly enjoyable. Highly recommend NOA. Great job team your energies are contagious and I come out feeling extremely happy and healthy . Dr Tania is extremely thorough and personal. Reception team is also very accommodating. Rare gem in dubai!